The Panama Yellow-fronted Amazon Parrot or simply Panama Amazon (Amazona ochrocephala panamensis) is a subspecies of the Yellow-crowned Amazon; although in aviculture, it is sometimes listed as a separate species (Amazona panamensis). The natural range of the Panama Amazon stretches from Northern Colombia to Western Panama (including the Pearl Islands and Coiba). Panama Amazons average 12 to 14 inches (~31 - 35 cm) in length (including tail) and weigh around 13.4 ounces or 380 g.
They have a yellow forehead and a blue wash on the crown. The beak is greyish horn with a dark tip and their feet are horn colored - almost might. They are sometimes confused with the Yellow-crowned Amazons; however, the Panamas are smaller, are a darker shade of green, and their beak lack the orangy spots that can be seen on both sides of the Yellow-crowned Amazon's upper beak. 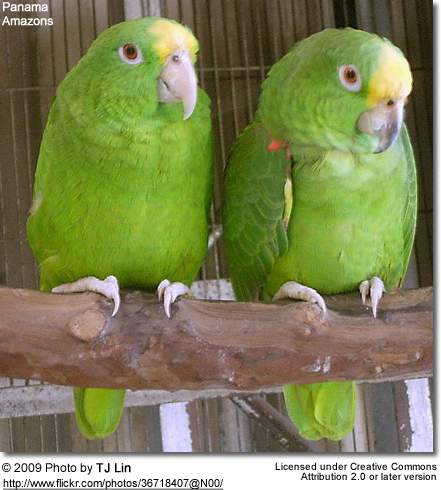 Additionally, the rest of the beak and cere are darker than that of true Panama Amazon Parrots. 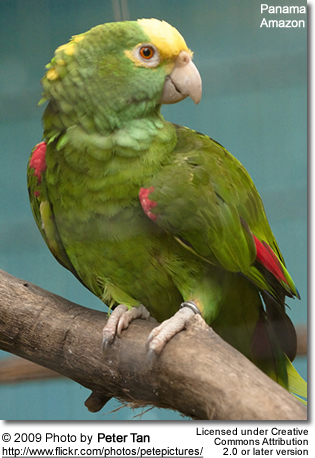 Compared to other Amazon Parrots, the Panama is considered to be relatively gentle. They are highly talented talkers, but can get very noisy. Breeding pairs produce, on average, 3 eggs in each clutch which are incubated for about 26 days. Panama Yellow-fronted Amazon Parrots are generally known for their good temperament, gentle personalities and outstanding talking abilities.